For the past couple of years I’ve focused more on marketing and customer service than on sales, but last Fall, Salesforce asked me to put together a presentation on the future of sales for Dreamforce. Just like the other 2 functions, sales is also feeling the pressure of change driven by the 3rd platform technologies and the general shift to the networked economy. In fact I think sales will be one of the centers of disruption going forward as more organizations start to realize that what has worked in the past is not working today, or at least not working as effectively as desired. Cold calling, once the staple of many a sales person’s prospecting, is virtually impossible today, even if most organizations haven’t figured it out yet. There are just too many ways to screen out unwanted sales calls for this to continue as an effective sales tool. Companies do not control the bulk of the available information about their products / brands. Content is available from all sorts of alternate sources from social networks to social media outlets. The company website is no longer the 1st choice for that content, instead consumers choose sources that have the perception of providing a more independent and “trusted” view. There’s so much available content though, that consumers need a way to filter out noise and get tot he useful information. They do not generally turn to the brand / company to do the filtering, instead they go to trust filtered networks as the more reliable source. Technology explosion as created a new environment for sharing and viewing this content. The connected mobile device is creating great disruption in many industries and online and offline converge in the device. This is particularly true in consumer retail, but it’s not limited to BtoC at all. “Telling” isn’t credible…and maybe “selling” is becoming less credible as well. It goes back to the content and to trust filtering. Why should I believe your company messaging and why should I believe your sales force? Noise. This is both a marketing problem and a sales problem. There is so much noise, spam, unfiltered content around that people are tuning it out more and more. Think about this, what was the last banner ad you remember seeing? What was the company and what was the message? I suspect that for most of you, you do not remember even seeing it. Selling isn’t about logic, it’s still about emotion, which is both the good news and the bad news. That’s a part of the noise issue, spam is rejected logically. How do you get past logic to emotion and trust? People don’t want to be “sold”, they want help educating themselves so that can make the “right” informed buying decision. The successful salesperson is an educator, not a traditional salesperson (I was thinking “huckster”, but that’s a little harsh). Someone needs to help people filter through all the available content to get to the relevant content that supports the buying decision. 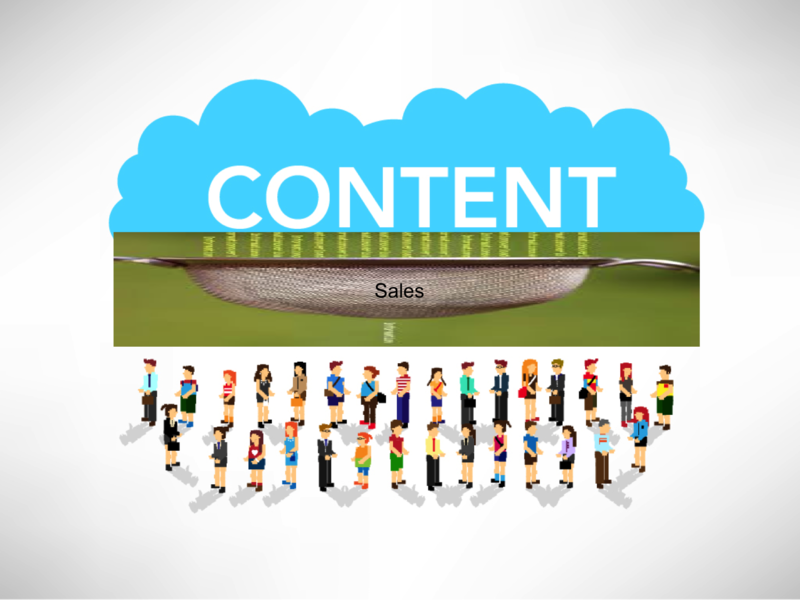 The salesperson that becomes that content filter can become an essential advisor. One way to build trust is through credibility. A thought leader has credibility and is a trusted source of content. The salesperson who earns the position of thought leader in an industry has a powerful tool for helping prospects make buying decisions. In the series on customer experience modeling I talked about the possible interactions that a company might have with a customer. Up front, the prospect must go through a period of realization of need, once there’s need then there’s potential for a sale (or I should say there’s potential for a prospect to make an informed buying decision). The sooner the salesperson knows about the need, the greater the opportunity to have some relevant interaction. That could be in the form of providing relevant content or even in helping a prospect connect with other customers, most likely in the company’s customer community. At the point that a prospect realizes his/her need there is an opportunity for conversation based on mutual need (person needs your product, you need them as a customer). If you can hold that conversation on the prospects terms (location, timing, etc.) then there is a chance that you can start to build trust and trust is the most important criteria for building an ongoing relationship. The basic tenet in social interactions is that you must give value to get value. It applies in customer communities, in social networks and ultimately in the sales relationship. There are some additional opportunities available for the modern sales force. In particular there is now a wealth of online behavioral data about your prospects. Analytics and socialytic tools can help increase sales effectiveness by providing insight into a prospects intentions, needs, opinions, etc. This type of insight can help a salesperson interact in an appropriate way and at the appropriate time, increasing the potential for building an ongoing relationship and ultimately getting a positive buying decision. Predictive analytic tools are beginning to develop that could take this insight even further, with a good dose of privacy and balance thrown in of course. Back to value for value, people are willing to share information in situations where there is an obvious return on that sharing, that’s a basic building block of the new networked economy.